A HUF is a separate entity for taxation under the provisions of S.2 (31) of the Income Tax Act, 1961. This is in addition to an individual as a separate taxable entity. This indicates that a person may be assessed in two different capacities- as an individual and as a Karta of his HUF. As the name suggests, an HUF is a family of Hindus. However, even Buddhists, Jains and Sikhs are regarded as Hindus, and can, therefore, set up HUFs. The concept of an HUF has basically evolved from ancient Hindu law. There are two schools of law governing HUFs in India - Mitakshara and Dayabhaga - and there are quite a few differences in the rights and obligations of HUF members in each of these schools. However, since the Dayabhaga school is largely confined to Bengal, we shall, in this article, only consider the provisions of the Mitakshara school, which are applicable to the rest of India. 4. An HUF need not consist of two male members. One male member is enough. For example, a father and his unmarried daughters may form and HUF. 1. To create an HUF you need to create a PAN card. 3. Prepare an HUF Creation Deed by transferring ancestor Assets, gift to the HUF a/c. 1. If the members of the HUF transfer the money in to the HUF account, then Income tax clubbing provision willl apply, and the income will be taxable in the hand of the individual member. 2. But the Clubbing provision can be bypassed if the amount transfer in HUF account is invested in tax free scheme. The tax free income can than be re-invested to earn even taxable income, Income on income is out of Clubbing Provision. All the members in your family, including your wife, children, their wives and their children. While the male members are called coparceners, the females are referred to as members. The senior-most male member is called the karta (manager), and a typical HUF consists of a karta, his sons, grandsons, and great-grandsons (all of whom are coparceners), and their wives and unmarried daughters (all of whom are members). 1. Under the Income Tax Act, an HUF is a separate entity for the purpose of income tax return. 2. The same tax slabs are applicable to HUF as to individual assessee. 3. You can not transfer your own assets/money into HUF. 4. If you have ancestral property and earning some income from this property, then it is better totransfer this asset to HUF and save tax up to exemption limit applicable to individual. 5. You can transfer the money received on sale of ancestral property /assets into your HUF. 6. The income from property of HUF can be further invested in instruments such as shares, mutual funds, etc. and will be assessed under HUF. 7. Existence of property or multiple members is not a pre-requisite to create HUF. 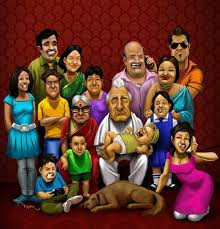 A family which does not own any property may still have the character of Hindu joint family. This jointness is understood in terms of faith and food. This is because as a Hindu is born as a member of the joint family. 8. Any gifts received by the members of HUF (birthday, marriage, etc.) can be treated as assets of HUF. 9. The HUF is taxable as separate person under income tax hence one can save tax from basic exemption of Rs. 2 lakh. HUF will also gain from the tax slab structure of computing income tax. 10. Apart from basic exemption of Rs. 2 lakh, section 80C deduction up to Rs.1 lakh is also available. Then what you are waiting for just take the benefit of HUF if you are married and decrease your tax burden.